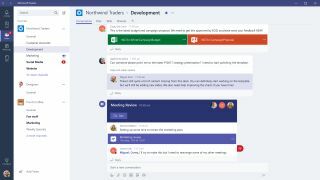 Ahead of its second anniversary, Microsoft has revealed that Microsoft Teams is now used by 500,000 organizations worldwide including 91 companies from the Fortune 100. The software giant's unified communications platform is also getting an update with eight new features including Microsoft Whiteboard, Data Loss Prevention in chats and conversations, live events, live captions, information barriers, customized backgrounds, Intelligent Capture and secure private channels. Microsoft Whiteboard, Data Loss Prevention and Live Events in Microsoft 365 are available today with live captions and information barriers coming soon and the rest of these new features will be available later this year. Microsoft also revealed that its own internal teams have migrated from Skype for Business to Microsoft Teams. The company is now using Teams for all chat, calling and meetings after 180,000 employees and vendors made the switch to its fastest-growing business app ever. Currently Microsoft Teams is available in 44 languages across 181 markets but at some point in the near future, Microsoft plans to add support for Hindi, Filipino, Telugu, Tamil, Marathi, Gujarati, Kannada and Malayalam. In terms of growth, Teams is now used by 500,000 organizations which is up from 329,000 in September and more than double the figure of 200,000 which the company reported last year. Microsoft has been trying to carve out a place for itself in the chat-based collaborative software space which has been dominated by rival Slack and has seen competition from Google in the form of Hangouts Chat and Facebook's Workplace. Teams users can now take advantage of Microsoft Whiteboard to work together on an “infinite canvas” directly in Teams, use DLP to prevent sensitive information from being shared in chats and channel conversations and create live events in Microsoft 365. We will likely hear more on the rest of the new features coming to Teams when Microsoft prepares to implement them later this year.